The Coasters adopted a slightly unfamiliar 3-4-3 formation and made two changes, with Lewis Walters and Timi Odusina replacing Nick Haughton and Arlen Birch. Odusina took his place in a back three, with Zaine Francis-Angol and Walters providing the width. 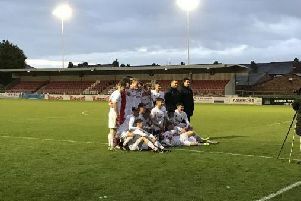 Both teams had won through to the FA Trophy final three days earlier and the hosts started the game full of confidence. They had the first sight of goal when Jordan Tunnicliffe handled the ball on the edge of his area and Orient skipper Jobi McAnuff sent the free-kick over the bar. The first gilt-edged chance fell to the Coasters on five minutes, when Alex Reid chased a long ball, and was met by the onrushing Orient keeper Dean Brill. The ball fell to James Hardy 20 yards from the open goal but his effort was deflected wide by Dan Happe. At the other end, Josh Koroma was making his presence known, dancing into the box and claiming a penalty which was denied. Fylde earned themselves a few corners thanks to Francis-Angol’s energy down the left but couldn’t make them count. 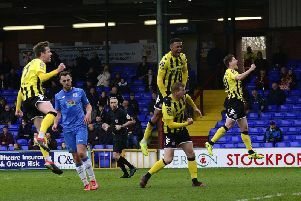 They went closest when Francis-Angol sent an angled cross in to Neill Byrne but he steered his header wide of the goal. Leyton Orient did make their corners count, and opened the scoring after 15 minutes, when Marvin Ekpiteta rose to head goalwards and the ball was deflected in off Danny Rowe. The O’s second penalty shout of the evening was a much more convincing one as James Brophy nipped passed Byrne, and was bought down. The referee pointed to the spot and Macauley Bonne fired expertly into the bottom left corner to make it 2-0 on 24 minutes. This seemed to wake the Coasters up and they enjoyed long spells of possession, but twice Rowe couldn't get shots away and Fylde were still two down at half-time. This prompted a double substitution and change of system for the second half, with Haughton and Ash Hemmings replacing Odusina and Reid as the Coasters reverted to 4-3-3. Hemmings looked to make himself an instant nuisance on the right, firing over after driving towards goal. Haughton looked to bring the energy of Hemmings into play with long searching balls but the O’s defence were fantastic in snuffing out chances. And the hosts almost had a third but Josh Coulson's low effort flew just wide. While Orient continued to pose a threat with the pace of Bonne and Koroma, the Coasters had to work hard to forge openings. Perhaps the best of them came when Hardy found Walters, whose low shot from an acute angle was palmed to safety by Brill. Orient’s next big chance came when Craig Clay found James Dayton at the back post only for his header to be superbly stopped by Jay Lynch on his line. Dan Bradley was introduced for Hardy and almost halved the deficit from Hemmings' whipped cross but his header glanced just wide. Tempers flared as Bradley and Clay had an altercation which prompted a coming together of both teams on halfway. The incident resulted in three of the game's eight yellow cards. Five of those were shown to Fylde, who had begun the evening with the league's second-best disciplinary record. Haughton went closest to giving Fylde a lifeline in the closing stages with a dipping 25 yarder but it was to no avail. Fylde remain fifth but now trail the leaders by nine points. Fylde: Lynch, Walters, Odusina (Hemmings 45), Byrne, Tunnicliffe, Francis-Angol, Philliskirk, Croasdale, Hardy (Bradley 68), Reid (Haughton 45), Rowe; subs not used; Brewitt, Crawford.